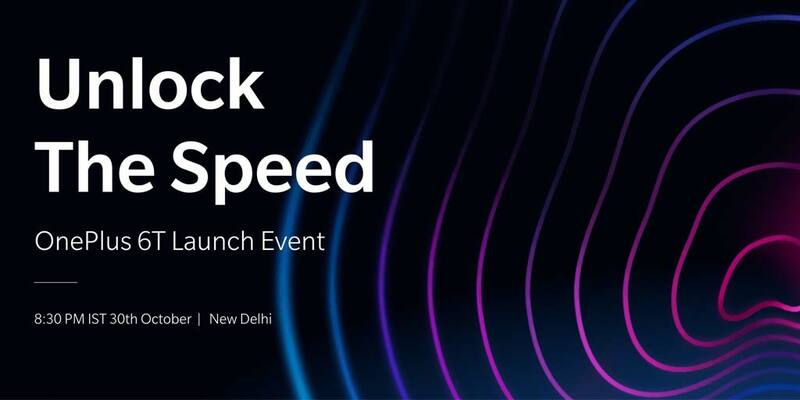 Update (19th October): OnePlus reschedules the OnePlus 6T launch event to 29th October in order to avoid colliding with Apple Event which is scheduled on 30th October. In a forum post, OnePlus said that those who own a ticket but won’t be able to make the event will be able to apply for a full refund for their ticket. Those who would like to join the event, OnePlus will cover the costs that may incur during the change of plans. OnePlus also said that the team will be getting in touch with all ticket owners individually for the help. Please check this official announcement from OnePlus to know more information about the rescheduled event. India launch will go on as per the schedule i.e. 30th October at KDJW Stadium, inside Indira Gandhi Sports Complex, New Delhi at 8:30 pm. Earlier (8th October): OnePlus is all set to launch its next Flagship smartphone OnePlus 6T. Today, OnePlus has officially announced that the successor of OnePlus 6 will be launching Globally on 30th October at Pier 36 in New York and in India at KDJW Stadium, inside Indira Gandhi Sports Complex, New Delhi at 8:30 pm. Tickets to OnePlus 6T launch event can be purchased from the company’s official website. You can also watch the live stream on OnePlus.com and official OnePlus YouTube channel. All the attendees would get the chance to be one of the first people to experience the OnePlus 6T. The ticket also includes an exclusive OnePlus Pin-set, OnePlus Sketchbook, a OnePlus Bullets Wireless , A brand new yet to be announced OnePlus gear, Snacks and drinks. Launch invites in India will be available at ₹999 via oneplus.in from 10:00 AM IST on Wednesday, 17th October 2018. All all fans who attend the launch event will get a gift hamper full of super add-ons and OnePlus merchandise. The ‘Notify Me’ page for pre-registration of OnePlus 6T is live on Amazon.in. How to win a trip to OnePlus 6T launch event? You can also submit your entries on the community forums and social media but first preference will be give to Google Form submissions. This contest is only open to residents of USA and India, aged 18 and older. Stay tuned with us on Facebook and Twitter for latest updates.